Now here's one that doesn't come along every day, the Martin PBM "Mariner." It's a big, fat flying clog. But—and this bears repeating—I don't talk to pilots in order to draw their airplane. 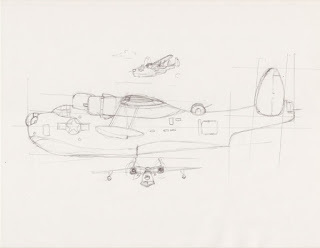 If I did, all I'd ever draw would be P-51s and Spitfires. Instead, I draw the airplane so I can talk to the pilots. In this case, the pencil sketch above is an easy sacrifice in order to get one of my most fascinating interviews to-date. Before I get into that, a little background on the PBM is in order. 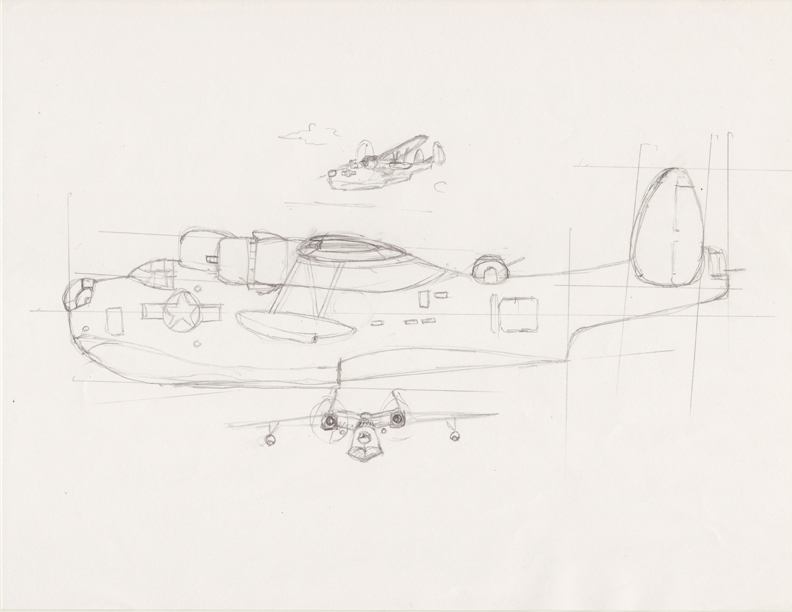 It's a late '30s design intended to be an inventoried alternative to the famous (and slightly less ugly) PBY "Catalina." Looking at the vital stats, however, I'm not quite sure why it was procured. 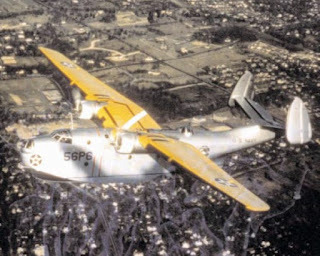 Though about 20% larger, the PBM's range of 2,600 miles and bomb load of 4,000lbs are essentially the same as the PBY's. Then again, those were the days when equipment strategy valued diversity much more than it does in today's one-aircraft-to-rule-them-all thinking. Perhaps I'll get to the bottom of it in this process but in the end, 1,300-some PBMs were delivered to the Navy and Coast Guard (as opposed to 2,600-some Catalinas). Now, I've been pretty negative on the Mariner so far. In the spirit of fairness, aside from looking like a Babushka and me-too performance stats, the PBM was a pretty solid combat aircraft. According to my cursory research, PBMs took part in at least 10 successful U-boat sinkings, laid mines in both oceans, sunk a number of ships (mostly in the Pacific) and rescued untold numbers of extremely grateful people from an otherwise watery doom. 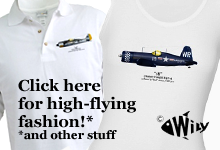 And the best endorsement is this: her pilots actually liked flying it! And if there's anything I've learned over the years it's this—your favorite airplane is the one your flying. Ok, have a look at the picture below. and would really like to give the builder credit. It's really a spectacular creation. Now, notice one other thing: the markings. 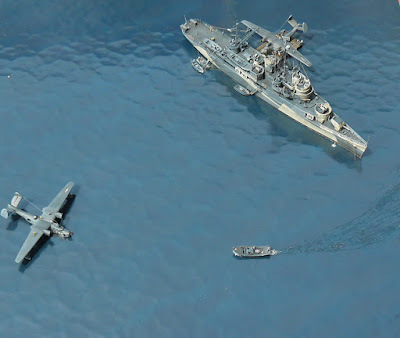 Whoever built this diorama has captured the brilliance of the mid-war Navy "Tri-color" camouflage. Aside from the giveaway of a shadow, the Mariner and ship blend into the dappled sea beautifully. 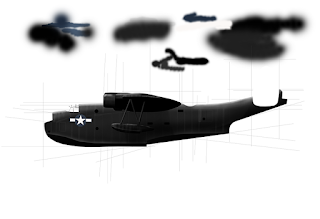 Knowing the pilot had flown virtually every sea plane in the Navy's inventory, and knowing he preferred the PBM, I readied my minds-eye for rendering acres of slab-sided dark blue, medium blue and white paint. Imagine the surprise when, after asking for confirmation of his beast's Bureau Number and aircraft number, he said, "And it was black. All black." "Yes. All black. I was a Nightmare pilot." Ok. It's time for you to meet the pilot, Cass Phillips of VPB-20 and the current state of progress on his airplane. I figure I'll have this Nightmare done in time for Christmas and in the next post, we'll understand what it was like to fly this coal-colored boot straight into the Japanese worst dreams. Oh. And back to that comment I made about drawing airplanes in order to engage the pilot. Cass sat down for a little interview at the Naval Air Museum in Pensacola, Florida. Though there's a lot more to share, this is the kind of stuff that makes me look forward to my golden years. I only hope I have half of Cass's sense. More to come. In fact, I've got about 60 minutes video of the man let alone finishing out his PBM!